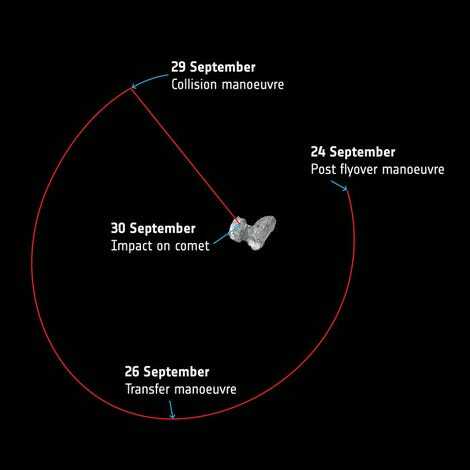 In two weeks, the European Space Agency will crash-land its prized Rosetta spacecraft, marking a dramatic end to the whirlwind two-year science mission that saw humanity’s first-ever comet landing. It’ll be 48 action-packed hours as Rosetta descends to its ultimate resting place on Comet 67P—and to get you properly excited for that event, we wanted to share the fascinating reason this site was chosen. Recently, the European Space Agencyreleased images of the Rosetta spacecraft’s planned impact site, located near the top of Comet 67P’s smaller lobe. The site has been named Ma’at after the ancient Egyptian goddess of harmony, balance, and order—perhaps in the hope that Rosetta’s slow-mo crash landing will channel some of these qualities. A more accurate name for this region might have been Mordor. Littered with goosebump-like boulders and deep, treacherous sinkholes, Ma’at is a rugged and inhospitable place, prone to violent outbursts of gas and dust. 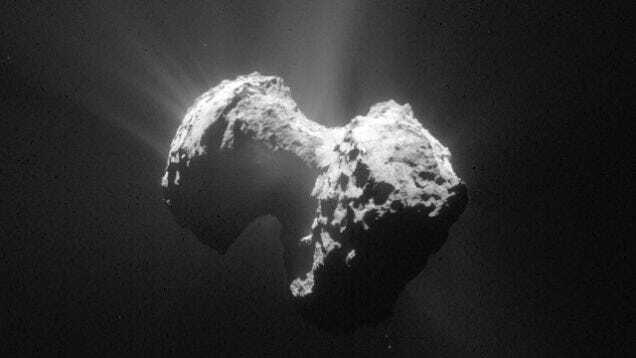 But the very same features that give Rosetta’s landing pad a frightening appearance also make it a scientific gold mine. In fact, it’s possible this spot could hold the key to understanding how comets form. As Rosetta descends on the evening of the 29th, it’ll be angling its OSIRIS camera to get a good look at several pits, capturing some insanely detailed glamor shots before it loses communication with the Earth. “We’re trying to cram as much [data] collection as possible into this final section, and we hope to get the highest resolution images of the entire mission,” Taylor said. Ultimately, the lander will be targeting the side of a 130 meter-wide pit known as Deir el-Medina, an appellation that once again pays homage to ancient Egyptian culture. (Deir el-Medina was home to artisans who worked on tombs in the Valley of the Kings.) Rosetta isn’t going to be entering the pit—at least not on purpose. Rather, it’ll be side-eyeing Deir el-Medina from an angle that offers good illumination as it aims for the pit’s rim. “Everything looks better by doing it this way,” Taylor said. Of course, Rosetta’s other scientific instruments aren’t just going to sit tight while OSIRIS has all the fun. 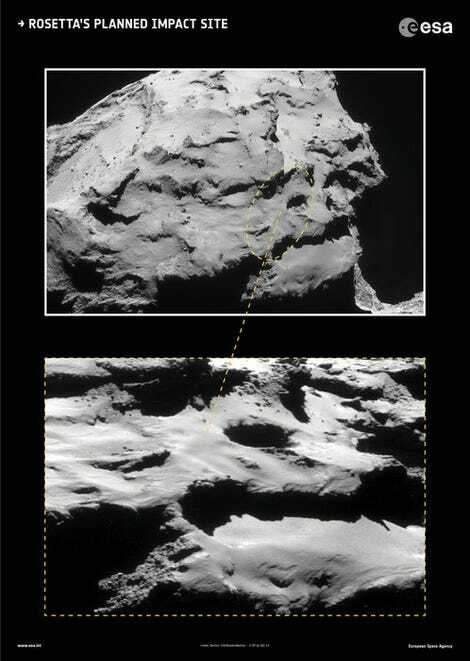 As the spacecraft dives through Comet 67P’s hazy coma, it’ll use its mass spectrometer to sniff out a variety of molecules within the gas, which early scientific reports have likened to cat piss. Rosetta will also be tasting Comet 67P’s airborne dust, and using plasma measurements to study how the solar wind interacts with the surface. “Really, this is a massive bonus for us in terms of science,” Taylor said. There’s one other thing to know about the Rosetta spacecraft’s final resting place. Ma’at is located on the same chunk of Comet 67P—the head—as therecently rediscovered Philae lander. The two spacecraft will be just a few kilometers apart. So, even as humanity’s favorite icy rock plunges into the frigid void of the outer solar system and our communications go dead forever, sentimental space nerds can console themselves with the knowledge that neither Rosetta nor Philae will ever truly be alone.